GOT7's Jackson has been caught creepin' on Instagram. The idol star must've been surfing Instagram accounts and landed on the page by the ID of kkvsh. 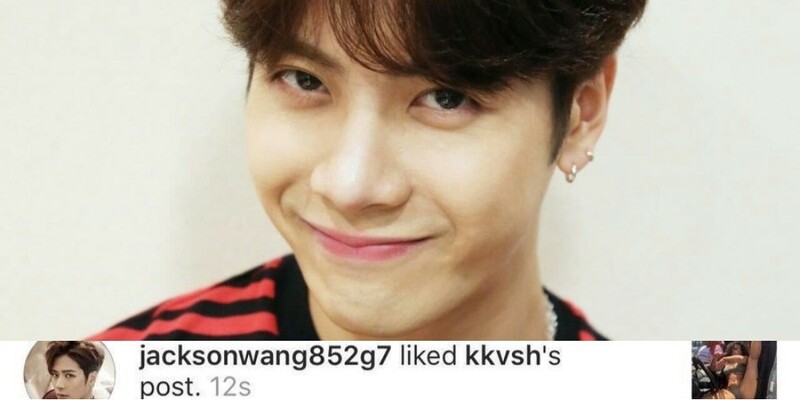 The page is of an Instagram model who posts raunchy photos and videos, and on March 23, Jackson happened to 'like' a post from two days ago. Fans believe Jackson had accidentally pressed 'like' while checking out the account because he immediately 'unliked' it a few moments later. But what's done is done. Fans are flooding the model's post with comments about Jackson, stating, "JACKSON LIKE THIS IM CRYING", "aye Jackson gettin it", "LOL he accidentally liked this post", "lmfaosidkdkd Jackson please", "Jackson in trouble now", "Jackson exposed himself", "Let him live." Meanwhile, Kkvsh started following Jackson on Instagram. Well, idols are humans too ya know. It's alright Jackson.